At Superior Remodelers, we are your go-to commercial and home remodeling company in Trumbull. We offer the highest quality home improvement options such as replacement windows, siding installations, spray foam insulation, roofing, garage and attic solutions and so much more! We can replace any old installation on your home or simply upgrade your existing features to better fit your lifestyle and design ideas. If you are looking for any home repairs or renovations for your home or business in Trumbull, CT or surrounding areas, contact us at 888-330-8148 for help. Henry Showah Construction, LLC of Trumbull, CT gave us a testimonial for roofing system installed in June 2012. We installed Certainteed flagstone colored vinyl siding with white corner posts, along with Okna 500 series deluxe windows. We then removed the old entry door, put drywall down and covered the wall in siding. Lastly, we installed an Okna PD8800 patio door. 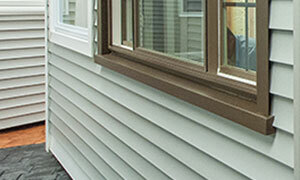 Sidings add beauty to your home and serve as a layer of protection against the elements. Investing in vinyl does not hurt the pocketbook.